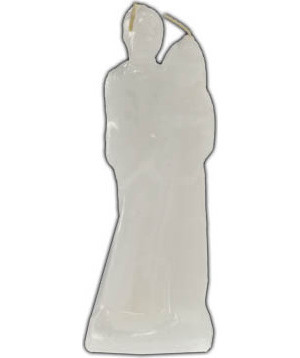 This wax effigy depicting a bride and her groom is black and stands approximately 6 and 1/2 inches tall. This wedding cake topper style candle is used to celebrate the marriage ceremony and union of two souls. May aid the creation of balance and harmony within the union of both the couple and their families. When utilizing human figure candles it is suggested to baptize or name the effigy, an example of this would be; carving the person's name whom the spell or ritual is for into the base of the candle. Symbols associated with the end result may be carved into the candle as well and the figure candle may be anointed with oils that correspond with the intentions of the casting. The base of this candle may need leveled for the candle to sit straight on a flat surface.